Football Champions Cup is easy to play. 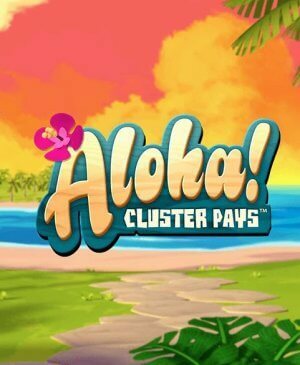 Before you start playing, you don't even have to check out the pay line as you cannot alter them anyway. The slot has five reels and three rows, giving it a standard layout. The standard symbols on this slot range from the ten to the Ace and are just to fill up the game. The animations all have to do with football. Before you start playing, you have to select the country you want to play as. You can also change countries later on in the game. Which country you are only matters during free spins and it doesn't even matter that much. 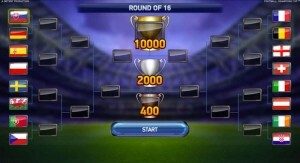 Football Champions Cup is a slot by Net Entertainment that fully focuses on football fans. The slot was released right before the European Cup in 2016 and that makes sense. Namely, Netent is a Swedish company and the Swedish national team qualified for the Euro cup. The slot looks a bit simple at first glance. The slot doesn’t really use appealing animations, but this simplicity is what makes this game so refreshing. 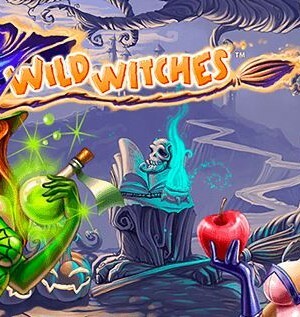 This slot completely revolves around free spins and the bonus game. These two elements are the highlight of the game, especially because free spins are played like a tournament, making it even more exciting. Because, of course, you will want to win! How to play Football Champions Cup? Football Champions Cup is easy to play. Before you start playing, you don’t even have to check out the pay line as you cannot alter them anyway. The slot has five reels and three rows, giving it a standard layout. The standard symbols on this slot range from the ten to the Ace and are just to fill up the slot. The animations all have to do with football. Before you start playing, you have to select the country you want to play as. You can also change countries later on in the game. Which country you are only matters during free spins and it doesn’t even matter that much. 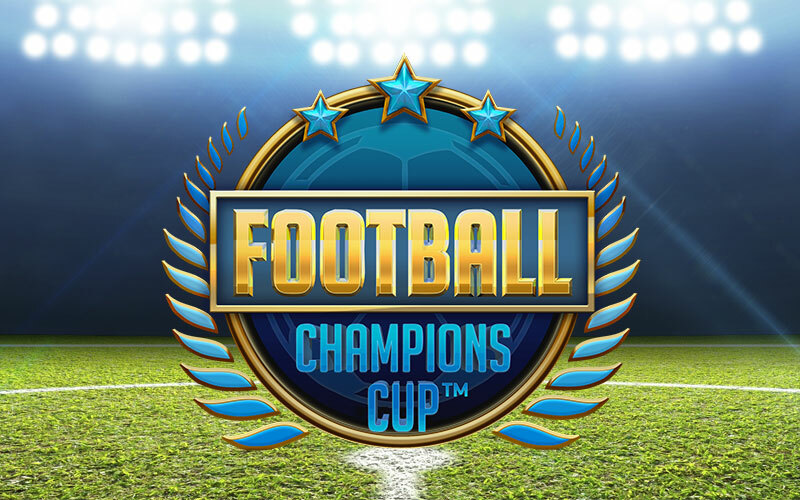 Football Champions Cup is equipped with some very exciting free spins. In order to enter free spins, you need at least three cups. 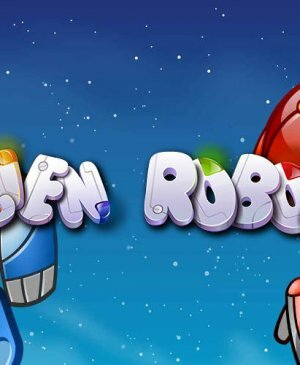 When three or more cups land on your reels, you immediately enter free spins. You receive rather few free spins but that isn’t important. What’s important is that you want the game. Each time a blue wild lands on your reels, you country scores. These blue wilds can only land on the first and second reel. If a red wild lands on either reel four or five, it means your opponent has scored a goal. At the bottom of the screen, you can find the score. 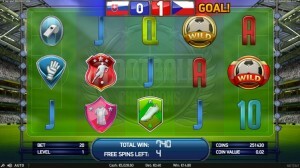 If you want the match, you fo on to the next game and here, you also receive five spins. If you eventually win the tournament, you even receive an extra prize! Football Champions Cup is also equipped with a bonus game. When the bonus symbols appear on your playing grid at least three times, it’s time to score some penalty-kicks. 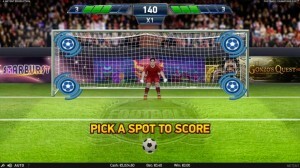 First, you are the shooter and you have to select one of the four possible corners of the goal. If you score, you receive a cash prize. If you miss, you get nothing. Next up, you’re the goalkeeper. Here, you also have to choose one of the four possible corners. If you prevent your opponent from scoring, you win a multiplier. So, also during this bonus game, wins can really add up. Also, the bonus game has been executed well and fits perfectly within the overall theme of the game. Football Champions Cup has a total of 20 pay lines and you cannot determine how many of them will be active; all of them will. You can, of course, still alter your total wager. You can do so by altering the coin value and the number of coins per pay line. Also, the slot is equipped with an autoplay function which you can use if you want to just sit back and watch the game play automatically. The slot does not have a jackpot but it does have a feature.